Play Temple of Nudges Slot Online with 500 Free Spins! Temple of Nudges is a 5 reels, 243 paylines online slot game by Net Ent. Temple of Nudges has Respin and Nudge features and an RTP of 96.03%. If you want to play Temple of Nudges the best place to do it is here with us at Rose Slots, where we also host more than 500 leading UK online slots including Fluffy Favourites, Starburst, Rainbow Riches and Great Rhino. We’ll clear one thing about this slot up right at the start of this review; even though the name is clearly a play on the popular Indiana Jones movie ‘Temple of Doom’, there’s no Indiana Jones character anywhere to be seen in Temple of Nudges, and nor does it have an action-movie theme. If that’s what you came here looking for, we’re sorry about that, and we suggest you head back to our library of online slots and play Da Vinci’s Treasure instead, which should be more to your liking. If you’re prepared to stick around and give Temple of Nudges a go, though, you’ll find it to be a well-put-together and rewarding Aztec-themed slot. 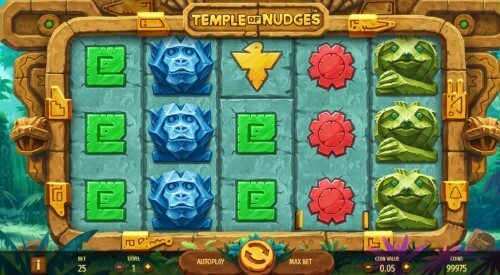 We say Temple of Nudges is Aztec-themed because of the design; the background behind the reels makes it clear we’re in an exotic jungle, with the reels and the symbols on them being carved out of stone. Ornate engravings including a serpent leer at you in a sinister manner from the frame of the reels, so it’s best to ignore them and focus on what’s spinning instead! All the action happens on a standard 5x3 layout which offers 243 ways to win - a figure that’s achieved by allowing for paying lines to occur when symbols appear on adjacent reels. They don’t have to be perfectly lined up as long as they’re within one row of each other. Symbols in this slot have a habit of stacking, too, which helps with the win ratio. Symbols in Temple of Nudges come in four colors; red, yellow, blue and green. The pattern repeats twice; you get one stone carving of each color to make up the lower values, and then the higher values are represented by a blue monkey, a green snake (at least we think it’s a snake; it could just as easily be a slot! ), a yellow anteater and a red jaguar. We believe this may be the first appearance of an anteater as a symbol in the history of online slot games. That’s it for this slot in terms of symbols - there are no scatters or wilds of any kind. Normally that would mean that there are no bonus features, but that isn’t the case. Temple of Nudges does have some bonuses to offer - it just serves them up a little differently to most online slots! Keep your eye out for the word ‘Respin’ being printed on any of the symbols; it could play into your favor when it comes to the bonus features, which we’ll explore now. Swedish casino company Net Entertainment, better known as Net Ent, has been active in the world of slot games since 1996. They started out life designing and manufacturing physical slot machine games and cabinets, but they were one of the fastest brands to recognize the potential of the internet when it came to online slots. They were among the first to market with digital casino products, and made the most of their opportunity to grow into the market before most companies had got their shoes on. Such is the size of Net Ent that their products and slots have been translated into 24 different languages; a necessary move given that they have a presence in every major gambling hub in the world. For the purposes of regulation in the UK, they’re stationed in Malta. With so many years of operation under their belt, Net Ent have an instinctive feel for what will make a great online slot and what won’t. Not every slot they release is great like their most successful slot Starburst, but the majority of them are very good. Dead or Alive, Excalibur and the eccentric Finn and the Swirly Spin are also among their best known and most popular releases. It’s hard to say whether they’re the largest online slots developer in the world, but we’d have to say they’re the most rock ‘n roll - the official slot of Jimi Hendrix slot, Motorhead and Guns n’ Roses are all Net Ent products. There’s one bonus feature in Temple of Nudges which splits into two. As you may have suspected from the slot’s title, the humble old nudge button - a staple feature of slot machines in the 80s and 90s - is heavily involved. The Nudge Feature of this slot activates automatically, and it’s a simple process. Every time you find a payline, the reels automatically nudge themselves and drop down by one position, resulting in five new symbols across the top row. With a bit of luck, you’ll get a new win from those new symbols, and the nudge will then repeat. This will keep happening until no new wins are possible from the new symbols. You may see ‘Respin’ printed on some of those new symbols, and that’s because of the Respin Feature. Only symbols which appear on the reels due to the nudges can have this label. If it’s there, every symbol which matches the symbols used in the winning combination (not just the ones which make up the win - any matching symbol on the reels) will freeze into place, and the reels will spin again. The idea is that more matching symbols will be found. If they are, the reels will spin once more, and this will continue until there are either no more matching symbols to be found, or you’ve totally filled the reels with matching symbols. That will earn you the slot’s jackpot. Temple of Nudges is a well-drawn, easy-to-play online slot game that won’t demand too much concentration from you, and has bonus features which take care of themselves. If you can get on a good run with the nudges and the respin bonus, it can become quite generous.